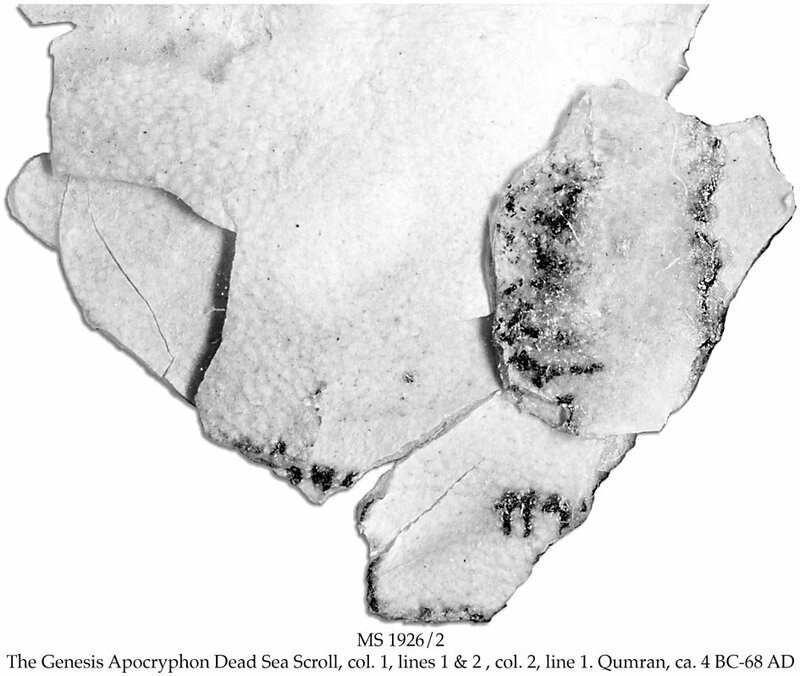 Description	 MS in Aramaic on vellum, Qumran, ca. 4 BC-68 AD, 3 fragments, 2,8x2,5 cm, 2,3x2,9 cm, 1,3x1,0 cm, part of 2+1+2 lines in a Herodian Hebrew book script, from a scroll of 4 membranes, 31x283 cm remaining, 22 columns, ca. 34 lines. Further 2 pieces of contemporary vellum repair material, 3,5x1,1 cm and 3,4x0,6 cm. Context	 Part of the Dead Sea Scroll 1QApocGen, now in Shrine of the Book, Israel Museum, Jerusalem. 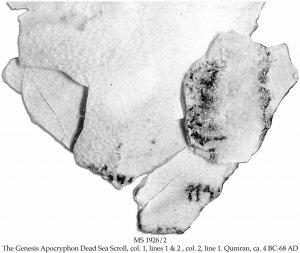 The 2 larger fragments from the present MS apparently matches the top of columns I and II. The rest of column I is lost, apart from remnants of the left margin, and fragments from 1Q20. The smallest fragment has not yet been placed. Provenance	 1. Community of the Essenes, Qumran (ca. 4 BC-68 AD); 2. Qumran Cave 1 (68-1947); 3. Muhammad Adh-Dhib of the Ta'amireh tribe, Judaean desert (1947); 4. Khalil Iskander Shahin ("Kando"), Bethlehem (1947-48); 5. Syrian orthodox Monastery of St. Mark (Metropolitan Athanasius Samuel), Jerusalem (1948); 6. Gift to John C. Trever, Jerusalem, Claremont and Laguna Hills, California (1948-1994). Commentary	 Originally written 1st half of 2nd c. BC, the Genesis Apocryphon is a form of parabiblical literature, which retells the story of parts of Genesis, embellishing it and adding haggadic details. It should probably be called more properly "Book of the Patriarchs", because it recounts in embellished form the stories of Noah and Abraham. It is related to the kind of literature one finds in the Book of Jubilees. Only one copy has been found of this unique text. This is the earliest Aramaic example of pseudoepigraphic literature that have come down to us, actually copied in the lifetime of Christ and the Apostles. Published	 (without the present fragments) Nahman Avigad and Yigael Yadin: A Genesis Apochryphon, Jerusalem, The Magnes Press of the Hebrew University, 1956. Published by Dr. Bruce Zuckerman and Dr. Marilyn Lundberg in: The Comprehensive Aramaic Lexicon, Newsletter, no. 12, Cincinnati, Ohio, Autumn 1996.